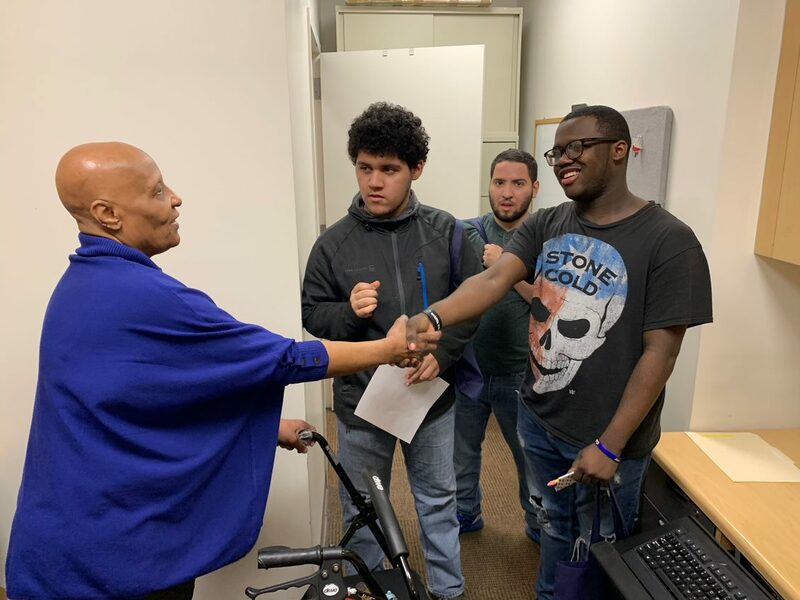 On March 21, a group of seven District 75 high school students came to YAI’s Central Office to learn about different career paths available for people with intellectual and developmental disabilities (I/DD). YAI’s Employment Services Program supports people with I/DD through every stage of the employment process, from resume writing, to mock interviews, to ongoing job coaching. Bonnie Holtzman, who coordinates YAI’s employment services, came up with the idea for the high schoolers’ job tour after observing the rich learning environment YAI provides to supported employees. Berta Land, who has been working at YAI for almost 40 years and oversees program-related mailing, knows all about staying engaged on the job. “It’s great to have a job, but once you have a job,” she said, “just don’t take anything for granted. Speak up if you don’t understand something, and just do the best you can.” Land started out working in a residential program before moving to YAI’s Central Office. After seeing different employees at work and learning about their roles, the students felt more confident about searching for their own jobs in the future. Aaliya, a student who loves cleaning and organizing, couldn’t believe there are jobs out there where you get a paycheck to do that kind of work. All seven students were able to take away a better understanding of what supported employment looks like, as well as inspiration for different career paths. Whatever their next steps toward employment may be, having firsthand experience at a job site will help them in their professional journeys. For more information on YAI’s supported employment or other programs, please contact YAI LINK at 212.273.6182 or link [at] yai.org.